Why doesn't Voyager in Star Trek go above the galactic plane to get back home? Related to Why do Star Trek vessels always approach each other on parallel planes?, but on a larger scale. The premise of Star Trek: Voyager is that the ship Voyager is stranded from Earth on the exact opposite side of the Milky Way. The series moves forward as they move around the disc of the galaxy in a rough semicircle. Why couldn't they simply point Voyager to Earth and go over/under the center of the galaxy? Wouldn't they then be able to use our supermassive black hole to slingshot them there and shorten the journey? No. They couldn't simply point Voyager toward Earth and go over or under the center of the Milky Way Galaxy. Our galaxy, while lacking the usual galactic bulge common to spiral galaxies, it has instead, a highly radioactive region due to a galactic collision in the distant past. This bar-like region would make any path through the core of the galaxy very dangerous. Voyager's flight plan was as direct a path as they could take. The black hole at the center of our galaxy is surrounded by a dense cloud of stars bound very close together by gravity and stellar dust which would make any form of slingshot maneuver unlikely or even impossible due to gravitational fluctuations, highly intense radiation fields, interstellar dust and the increased density of stellar matter. Despite images which portray our galaxy as having pockets of empty space by which ships can maneuver, in fact, nothing could be further from the truth. Even the regions which appear dark can be filled with dust particles and other barely-visible bodies. At faster than light speeds, even dust can take its toll on a starship unless that ship is able to push the dust away keeping the flight path clear. On most ships of the Alpha Quadrant, the technology performing that service is the deflector array. The deflector sweeps space ahead of the ship clear of all matter. Without such an array, faster than light travel would require VERY durable ships, since even tiny particles would strike with multi-megaton force. While the galaxy averages only a 1000 light-year thickness in any place outside of the galactic hub, there are still plenty of stars and in particular global clusters outside of the galaxy proper. These would still have to be navigated since star density drops with radius from the galaxy proper. There are several reasons ships would be loathe to approach the galactic hub. The most prominent would be that the Galactic Center is marked by an intense radio source named Sagittarius A. The motion of material around the center indicates that Sagittarius A* harbors a massive, compact object. This concentration of mass is best explained as a supermassive black hole with an estimated mass of 4.1–4.5 million times the mass of the Sun. While our galaxy has less of a galactic hub than most like it, the core is surrounded by a dense field of red dwarf stars, possibly from collision with another galaxy in the distant past. The closer you get to the center of the galaxy, the greater the density of both stellar dust and stellar bodies. Multiple stars can be found within distances of far less than a light year. Gamma-ray radiation levels are significantly higher in this region. The reason is, as yet, unknown. Even if Voyager wanted to take the risk and try to use the galactic core as a gravitation slingshot mechanism, the stellar density and erratic movement of stars, would make it VERY dangerous. The density of matter in those regions would more than likely overwhelm the deflector array also making it a suicide run. Voyager is a small ship. It needs to resupply fairly regularly to keep its crew alive and in decent health. The path they took gave them both an opportunity for exploration and a chance to interact with other species which could both give them opportunities for resupply and potential chances to interact with species with greater technologies which might shorten their journey. In addition to food and biomatter supplies to maintain the ship, they would require dilithium, a material which is "porous" to antimatter and thus powers a warp core, and reactor materials for the impulse engines. None of these would be easily available above the galactic plane, since the opportunities for meeting civilizations might decrease significantly there. Stellar formations called globular clusters would be the only dense star formations above or below the galactic plane and would be less likely to have the resources needed for a starship since most of those stars are long-lived, slow burning, red dwarfs, which do not support the supernova activity necessary to create heavier elemental materials needed by Alpha Quadrant vehicles or to support Life As We Know It. This is addressed in the Star Trek: Star Charts factbook. As you can see from the diagram below, the Galactic Barrier prevents ships from leaving the plane of the Milky Way Galaxy. 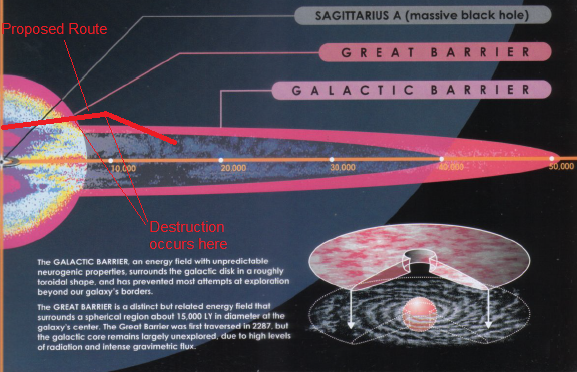 Any attempt to do (such as your proposed course over Sagittarius A) would result in the sort of near-certain ship destruction seen in TOS: By Any Other Name. Even if they did somehow survive and the crew didn't become insane, Voyager would likely be destroyed during their transit of the Great Barrier. As far as I know, the exact shape and extent of the Galactic barrier has not been revealed in-universe. Therefore, it might lie quite close to the edge of galaxy's stellar disk, and would certainly be something Janeway would not be eager to tangle with. The galactic map as we know it has signs around at least some of the edges which say "here there be dragons". With verified dragon sightings to back those signs up, it'd be foolish to hazard a single isolated ship against a potential insurmountable danger. The most likely thing I can imagine is that the gravity nearing the center be too strong for the ship's hull to withstand, forcing Voyager to go up above the center to the point at which the trip length was the same. This would mean having to take the same 70 years to get home, but with no planets on which they could refill their supplies and a lowered chance of encountering phenomena such as wormholes that might shorten the trip. There could be significantly more dark matter outside of a galaxy than inside of one. Warp drive may be affected by the amount of dark matter around the ship. To add to this, its like a ship staying close to shore you don't want to travel too far from civilization when in this kind of situation. If something went wrong they would have a very far distance to "limp" to get to somewhere safe. I bet even in Star Trek leaving the galactic plane would be considered dangerous. I think in the end it's still space and they are still human. Only a few malfunctions away from disaster I would rather stay close to safely. There are big-bads out there, and Voyager would do well to see them coming. Simply put, flying around without knowing the whos-who of the region they are in would be a death trap. Imagine if instead of hitting Krenim border patrols and being told "shoo", they actually got well within the border before being spotted. By routinely interacting with the locals, traders, and other explorers, they could maintain a picture of who and what lived nearby, and had a better chance of not-dying from a surprise encounter. This function was Neelix's real job from day one; working the galley was just his hobby between ports. The galaxy isn't two dimensional, taking the time to "fly" from the middle of our galaxy up and out of the galactic plane would add a minimum of 500 light years of travel. Also, Voyager needed materials to keep it going, they needed the ability to locate and harvest materials, something I imagine is much easier to do inside the galactic plane, especially when your sensors only travel a couple light years. Lastly, they are explorers looking for life forms that might have the means to provide them with faster travel, they need to stay by stars in order to find life. Two main reasons - one explained many times in the show, and another which can be deduced through an understanding of warp mechanics. First and foremost, Voyager is simply not designed for this sort of travel. It requires maintenance, raw materials such as Dilithium for the warp core, and exotic reactor elements for the impulse engines. The ship and crew simply cannot survive without supplies for that long. As for your second suggestion: a gravity slingshot around the black hole. That would work in theory, but only on a ship travelling through conventional space. Warp travel allows starships to travel many times faster than light, and while at warp orbital mechanics have no effect. The gravity of a nearby black hole might pull a starship out of warp, making it impossible to travel faster than impulse. And the gravity of a black hole can't possibly accelerate a ship faster than the speed of light, due to the laws of physics. we'll be looking for wormholes, spatial rifts, or new technologies to help us. This implies that Starfleet knows wormholes only connect within a galaxy and not beyond it. It's likely that Janeway does not expect to find any useful wormholes above or below the galactic plane. Spatial Rifts are likely to fit the same pattern. New technology requires advanced civilizations. Potentially, Voyage could find a nomadic race outside the galaxy but it's more likely to find advanced technologies where there are planets and stars. 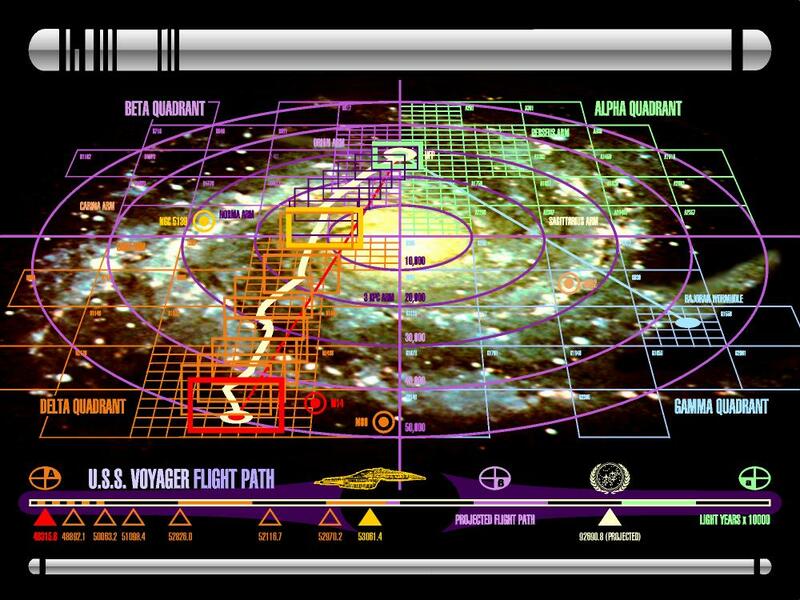 The reason why Voyager was unable to exit the bounds of our galaxy in order to simply "fly over it" was due to the galactic barrier already encountered in Star Trek: The Next Generation. Likewise the ship could not pass through the core due to a similar barrier surrounding our galactic core, which was encountered during the original Star Trek series. According to Star Trek Universe, Voyager wasn't directly opposite Earth/ Terra. 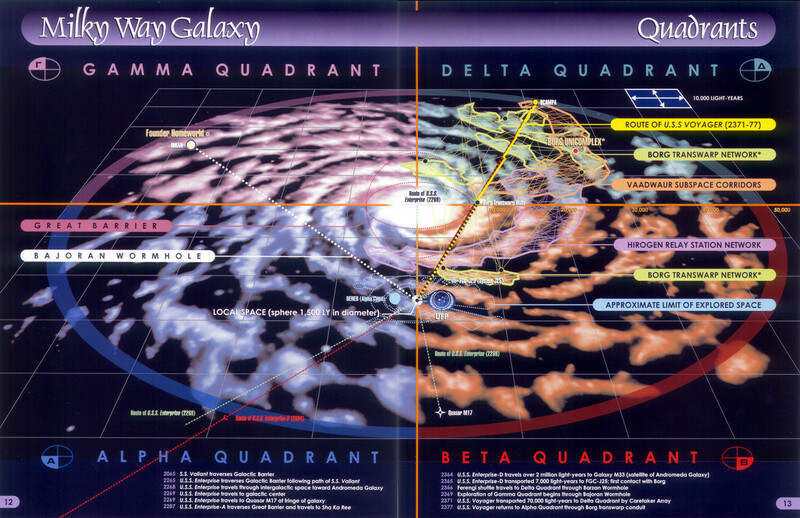 Earth, and the Federation lies smack dab on the border between Alpha and Beta Quadrants. Voyager took almost a straight shot from the Middle of the Delta Quadrant to the Earth. Especially when you factor in the great barrier. And all those saying they took an arc around the rings of the galaxy ignore key episodes where they clearly entered voids in space, going months at a time with no contact or even visually seeing star systems. Plus factoring in the space the crossed in episodes like when Kes hurls them 10 years and outside Borg space or where they go through wormholes/vortexes. Alcubierre style warp creates an alternate space and bends space around it so dust isn't a problem. You could possibly go right through stars since it would bend the star's space around it. Perhaps the black hole in the center of the galaxy is the only real obstacle. The region around the black hole isn't an obstacle. Not the answer you're looking for? Browse other questions tagged star-trek star-trek-voyager space-exploration or ask your own question. How does out of phase Voyager get back into phase? Why were there green Lumin discs above Borg regeneration alcoves and blue ones in random places in Star Trek Voyager? Why didn't Voyager get home in the first season?